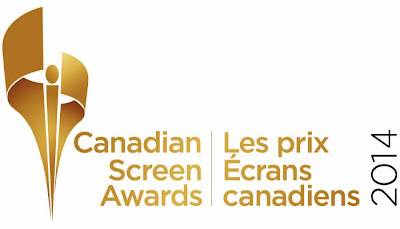 The 2014 CANADIAN SCREEN AWARDS nominees in film, television and digital media were announced today by the Academy of Canadian Cinema & Television. Nominees in 123 Canadian Screen Awards categories (22 film, 94 television and seven digital media) were announced today from simultaneous press conferences in Montreal and Toronto. The Academy has announced ten Academy Special Awards including today’s Cineplex Golden Reel winner. Additional Academy Special Awards and details of Canadian Screen Week events will be announced in the coming weeks. The Amazing Race Canada - Where in The World is Ogopogo? Murdoch Mysteries: Nightmare on Queen St. The Mortal Instruments: City of Bones, the eagerly anticipated big-screen adaptation of the first book of Cassandra Clare’s blockbuster fantasy adventure series, wins the 2013 Cineplex Golden Reel Award, it was announced today by the Academy of Canadian Cinema & Television. The Cineplex Golden Reel Award is presented annually to the Canadian film that earns the highest domestic box office in that year. The Mortal Instruments: City of Bones grossed over $5.2 million in Canada in 2013. “The Mortal Instruments: City of Bones has bolstered an impressive fan following for the franchise as a result of its box office success,” says Helga Stephenson, CEO, Academy of Canadian Cinema & Television. “The Academy is also very proud and excited to crown this film’s producer, Don Carmody, for the eighth time with the Cineplex Golden Reel Award, and congratulates distributor Entertainment One on its success,” adds Stephenson. The Academy will present the Cineplex Golden Reel Award at the CANADIAN SCREEN AWARDS on March 9, 2014 at the Sony Centre for the Performing Arts. This award marks the eighth win for Don Carmody as a producer of the Golden Reel winner. Previous Golden Reel winners are Resident Evil: Retribution (2013), Resident Evil: Afterlife (2010), Resident Evil: Apocalypse (2004), The Art of War (2000), Johnny Mnemonic (1996), Porky’s (1983) and Meatballs (1980). The Mortal Instruments: City of Bones is a Canadian co-production with Germany. The film is distributed by Entertainment One (eOne) in Canada, UK, Spain and the Netherlands, and stateside by Sony Pictures Releasing. It has been seen theatrically in over 20 countries and garnered approximately $100 million at the global box office, including $35 million in the US and Canada. It is now available on DVD. The Mortal Instruments: City of Bones has garnered six Canadian Screen Awards nominations.